Today I saw an interesting tweet lined up in my twitter stream about a Page Recorder utility developed by Dmitry Zhariy which aids in generating PageObjects for Selenium WebDriver tests. I could not resist to get hands-on with this tool and write this post. This project is hosted on GitHub https://github.com/dzhariy/swd-recorder and licensed under The MIT License. 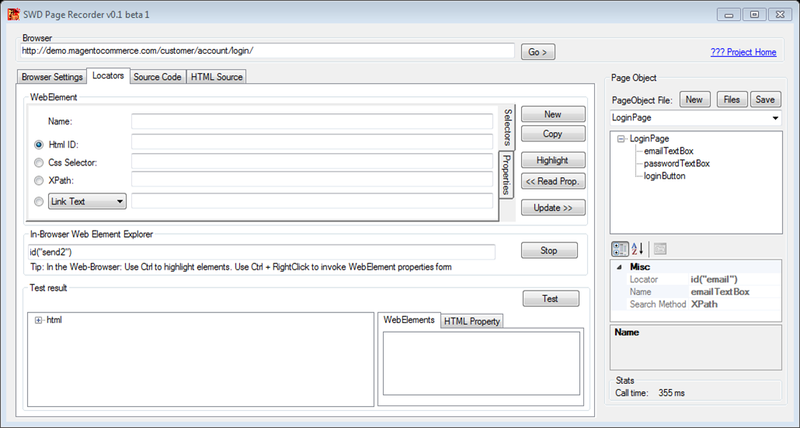 The SWD Page Recorder utility helps automation developers in finding and locating elements as well as creating page objects through a nicely built user interface. You don’t need to juggle around browsers and tools like Firebug/Developer tools in Google Chrome or IE to find/create locator strategies. This tool allows you to launch various types of browsers, navigate to page and spy on elements, look at their attributes, create & test locators. You can then use this information to generate page objects in various programming languages. 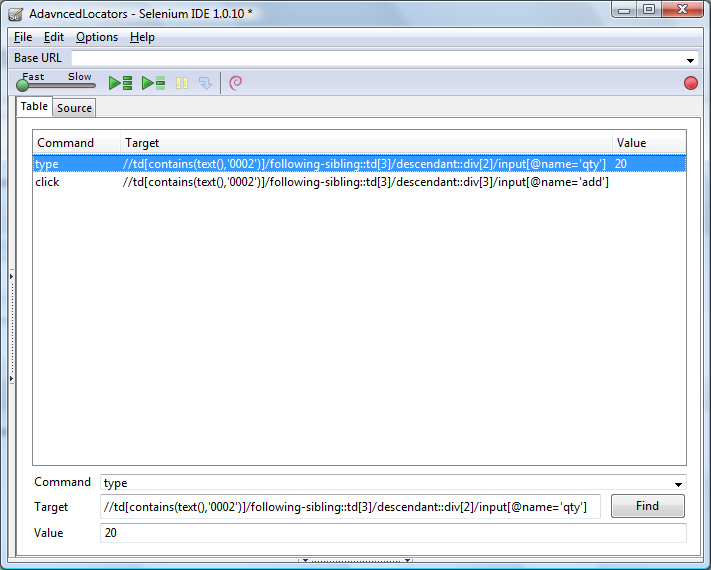 SWD Recorder can be used to test locators just like Selenium IDE on browsers like IE, Chrome and Safari. 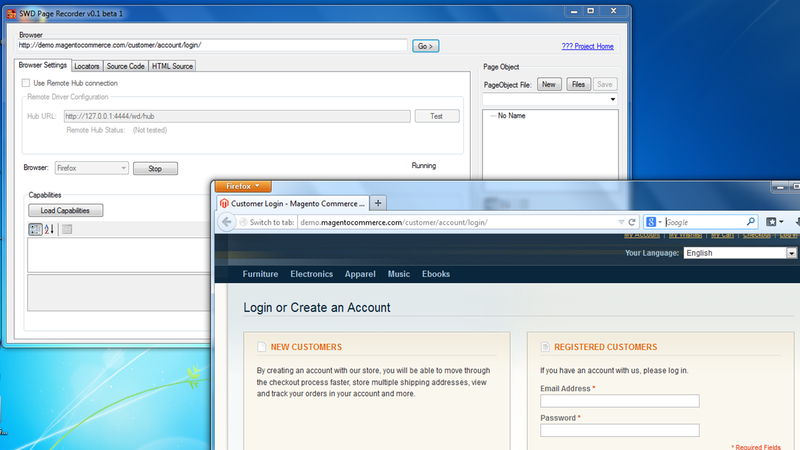 Launch the SwdPageRecorder application. On the main Window you need to select & configure Browser that you want to use from Browser Settings tab. It also allows option to connect to RemoteWebDriver instance. Select the desired Browser and hit Start button to start the Browser instance. By default utility points to http://www.yahoo.com. You can change this by entering desired URL in Browser textbox above Browser Settings tab and click on Go button. Switch to Locators tab and click on Start button in In-Browser Web Element Explorer section. Now switch to the Browser instance opened by SWD Page Recorder. Add a desired element by specifying a logical/descriptive name in Code Identifier textbox and click on Add element button. In this example I will specify emailTextBox in Code identifier textbox. You can also add elements manually or edit elements that are already added by using WebElement section. Elements can be highlighted using Highlight button to test that locator information is sufficient or debug the locator values. Once you capture all the elements needed for your PageObject, switch to Source Code tab. The source code tab provides templates for generating PageObject code in various languages (C#, Java, Perl, Python, Ruby etc.). Select a desired template and click on Generate button to generate the code. SWD Page Recorder generated following code the elements added from Login page. You can either copy the code back to the editor or save this in a file and done! Overall this utility worked pretty good. There are few glitches which I hope should be gone after beta is over. There is a scope for improvement in overall usability of the tool. Along with PageObjects I also want to see utility generating a sort of XML/Properties file based UI-Map. We saw how to use HTML DOM and XPath for Web Object Identification in Part 1 & Part 2. In this final Part we will explore using CSS for Object Identification in QTP 11. CSS (Cascading Style Sheets) is a language used for formatting and rendering of HTML and XML documents. CSS uses Selectors for binding style properties to elements in the document. These Selectors can be used by QTP as another object identification strategy. Finding elements with XPath can be costly in terms of performance. CSS Selectors can be more efficient as they are forward only. However they do not provide backword search flexibility as XPaths. Along with XPath, QTP 11 has added CSS Object Identification Property to all Test Objects in Web Add-In. You can specify CSS Selectors by using css Property. Browser("title:= Gmail: Email from Google").Page("title:= Gmail: Email from Google").WebEdit("css:=input#Email").Set "myname"
Browser("title:= Gmail: Email from Google").Page("title:= Gmail: Email from Google").WebCheckBox("css:=input[type='checkbox']").Set "ON"
Browser("title:= Test App").Page("title:= test App").WebEdit("css:=div#login_area input[name^='text_']").Set "somevalue"
Browser("title:= Test App").Page("title:= test App").WebEdit("css:=div#login_area input[name*='text_']").Set "somevalue"
Locating elements by the text they contain can be quite useful. To identify elements, we need to use CSS contains pseudo class. This will match the entire contents of the element. For more combinations please refer here. Browser("title:= ShopX").Page("title:= ShopX ").WebEdit("xpath:=td:contains('0002')+td+td+td>div>form>div>input[name='qty']").Set "10"
There are endless possibilities to identify objects using CSS and XPath. However these are some of the example to understand the basics. I will close this series with a caution that DOM, XPath, CSS type of identifiers are dependent on locations and page structure and may not work always where developers change the UI frequently. 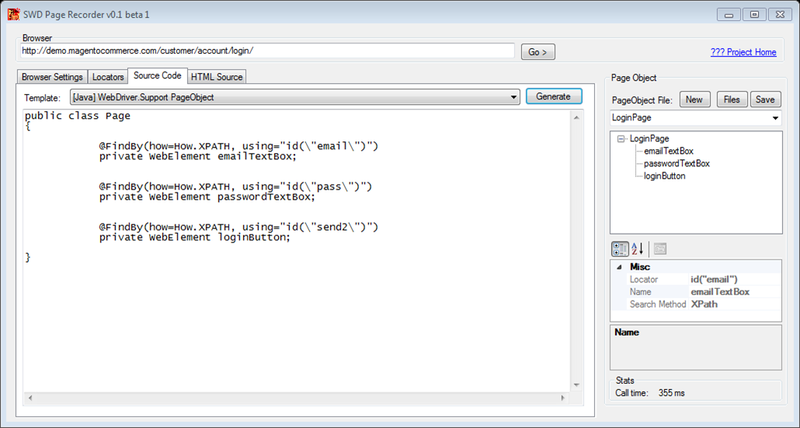 XPath is another important Web Object Identifier introduced in QTP 11. It is one of the widely used identification strategy in open source tools. In this tutorial we will understand using XPath for locating Web objects in your application with QTP. XPath is used for locating nodes in an XML document and it can also be used for locating HTML elements in XHTML. XPath opens up all sorts of new possibilities for locating complex & dynamically rendered elements. Awkwardly, developers not always follow best practices or testability guidelines while building the applications. XPath comes to your help when you don’t have a suitable id or name attribute for the element you wish to identify. You can use XPath to either identify the element in absolute terms or relative to an element that does have an id or name attribute. XPath locators can also be used to specify elements via attributes other than id and name. 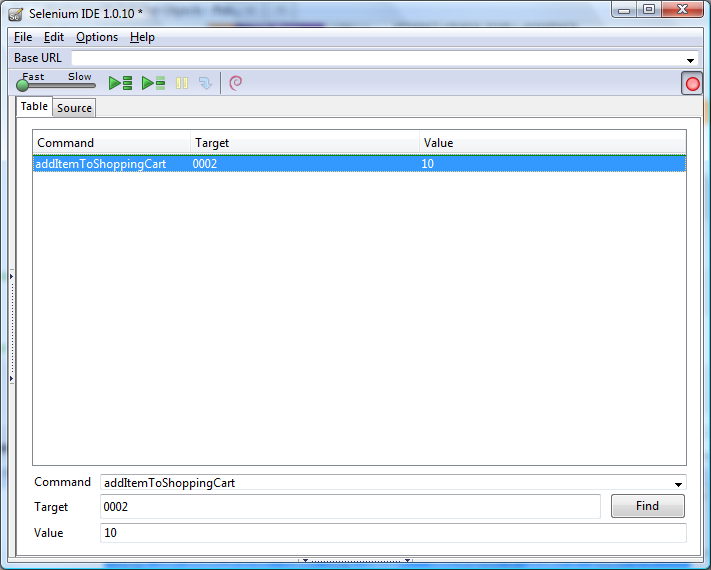 QTP 11 has added XPath Object Identification Property to all Test Objects in Web Add-In. QTP offers two ways to use XPath, you can either instruct QTP to record Automatic XPath by settings Options in Tools menu or you can specify User Defined XPath in xpath Property. In above example we used //input to identify the Search Text Box. Using // in XPath query is called greedy query as it parses the entire HTML DOM until it finds the desired element. This way is useful when objects are dynamically positioned; however it takes certain amount of time to find the element. Browser("title:= Gmail: Email from Google").Page("title:= Gmail: Email from Google").WebEdit("xpath:=/html/body/div/div/div/div/form/label/input").Set "myname"
Direct XPath query will find the element quicker, however if application GUI is going to change, it may fail if the element is moved into a different area of the Page. Browser("title:= Gmail: Email from Google").Page("title:= Gmail: Email from Google").WebEdit("xpath:=//input[@id='Email']").Set "myname"
Browser("title:= Gmail: Email from Google").Page("title:= Gmail: Email from Google").WebCheckBox("xpath:=//input[@id='PersistentCookie' and @type='checkbox']").Set "ON"
We can use XPath functions such as contains(), starts-with() & ends-with() to perform partial match on attribute values while locating the elements. This is useful when developers use Dynamic IDs or Name attributes while rendering the elements on a Page. This is commonly used in AJAX applications & frameworks. Browser("title:= Test App").Page("title:= test App").WebEdit("xpath:=//div[@id='login_area']/input[starts-with(@id, 'text_')]").Set "somevalue"
Browser("title:= Test App").Page("title:= test App").WebEdit("xpath:=//div[@id='login_area']/input[contains(@id, 'text_')]").Set "somevalue"
Locating elements by the text they contain can be quite useful. To identify elements, we need to use text() function in XPath query. This will match the entire contents of the element. We can also use XPath functions contains(), starts-with() or ends-with() for matching partial text. In simple terms XPath Axes helps to identify elements based on element’s relationship with other elements in a document. For more information, there is a nice tutorial available on W3Schools on XPath & XPath Axes. Browser("title:= ShopX").Page("title:= ShopX ").WebEdit("xpath:=//td[contains(text(),'0002')]/following-sibling::td/descendant::div/input[@name='qty'").Set "10"
QTP 11 introduced new features to identify Web objects using HTML DOM, XPath & CSS. These object identification strategies are widely used in open source tools like Selenium, WATIR etc. In this series, I will explain how to use HTML DOM, XPath and CSS for identifying objects in your Web application. In Part 1, I will use HTML DOM for identifying the Web objects. The W3C Document Object Model (DOM) is a platform and language-neutral interface that allows programs and scripts to dynamically access and update the content, structure, and style of a HTML document. To access the HTML DOM methods we need to use the document object. 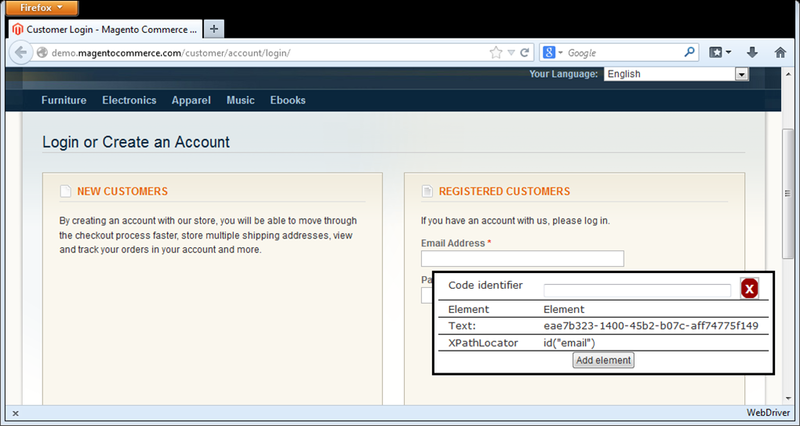 We can use getElementById method to access the element using its HTML ID. This method will return the first element it finds in HTML DOM with specified ID. For example on Gmail Login Page, we can access the User Name text box by following way. However there is another method which comes handy when you don’t have either IDs or Names specified for HTML elements. Using getElementsByTagName you can identify the object by Tag name. This is least preferred way to access the elements. In the next instalment we will see how to use XPath for locating the objects in QTP.